Last week, the commander of South Korea’s army logistics command paid a visit to Vietnam. The trip highlighted some of the ongoing activity by both sides, both in the logistics space as well as in their defense relationship more generally amid wider domestic and regional trends and developments. As I have noted before, both Vietnam and South Korea share a defense relationship as part of their wider ties, which were established in 1992 and then elevated to the level of a strategic partnership back in 2009. The defense component of ties involves various aspects, including visits, exchanges, and dialogues, and it is rooted in the inking of several previous agreements such as the Memorandum of Understanding on mutual support in UN peacekeeping operations and humanitarian assistance and disaster relief in 2006, which continues to be a pathway for the two militaries’ arms and services to implement cooperation. Last week, the defense aspect of ties was in the spotlight again with the visit of the commander of South Korea’s army logistics command to Vietnam. Lieutenant General Lee Jeong-keun, Commander of the Republic of Korea (RoK) Army Logistics Command, paid an anticipated trip to the Southeast Asian state, thereby highlighting this component of the relationship. Lee’s trip included a series of interactions. In terms of visits, he and his delegation met with a range of Vietnamese officials, and this included Vietnam’s director of the General Department of Logistics, Major General Tran Duy Giang. As is often the case, the discussions focused on a range of issues, including aspects of bilateral defense ties as well as other issues of mutual interest. Both sides also discussed some specifics on advancing logistics cooperation as well. 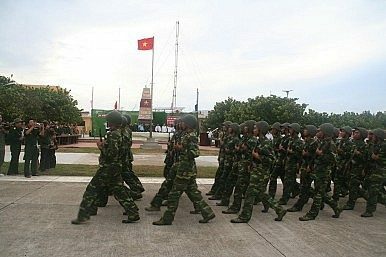 Per official Vietnamese accounts of the visit, in terms of concrete issues, Lee said he would do his best to try to realize the previous MOU’s focus on logistics support, and that the ROK Army’s logistics command would look to promote logistics collaboration and present several forms of equipment to the Vietnamese defense ministry in this respect. Both sides also discussed other areas of logistics collaboration, including delegation exchange and the sharing of information and experience in logistics management with due attention to the needs of both sides. Apart from these meetings, there were other engagements as well. For instance, according to Vietnamese accounts, after the meetings, the South Korean delegation visited several facilities that were related to the pursuit of logistics cooperation between the two sides. This included the Joint-Stock Company 26 under the General Department of Logistics and Factory Z131 under the General Department of Defense Industry. What’s in the New Vietnam-UK Defense Dialogue?Vietnam-Singapore Defense Relations in the Headlines With Military Chief Introductory Visit Vietnam-Laos Defense Ties in the Headlines With Border MeetingWhat’s Next for Vietnam-Thailand Defense Cooperation?What’s Next for EU-Vietnam Defense Ties?